We went from -30 degrees to 50 above in 2 day. What the F! Yesterday the day rained but got nice and warm, then the temperature fell hardl and last light the world started to get so slick and slippery. Going out was getting a little scary because of the ice. I went to bed a little afraid that I have to leave the house today for fear of slipping and smacking my face. It's a real fear and I know its bound to happen. I can already picture it, me walking along, maybe whistling a little tune, and smack, just like a cartoon character slipping on a banana peel. I will go down fast and hard. I am not a graceful person. But the day is going to happen and I have things to do that involve leaving he house.. I have the arnica and frozen peas ready just in case, but I might just leave on my hands and knees. Enough about my irrational (but totally rational) fear. Lets talk about food. I am already thinking ahead to dinner. Or more like I am thinking behind to last nights dinner of oatmeal. A grain typically used as a breakfast food, cooked until light and fluffy, topped with sugars and fruits and sweet things. Oatmeal for breakfast is always welcomed and always will be. But today my friends I am going to blow your mind and tell you to eat your oatmeal at dinner time,with salt and pepper and lots of yummy savory beans and veggies. But doesn't make complete sense? Oats are so good, hearty, heart healthy, and pretty freaking cheap. Easy to cook, goes with everything. It's almost like rice, but I find is even more filling and contains more protein. Have no idea what to do for dinner. Grab the oats and a can of beans! Had a long day at work and just want something quick and easy and comforting. Oats with a bunch of veggies! You can pretty much do anything with a bowl of oatmeal and it will be good. (tomato sauce, crispy tofu, a fried egg, cheese if you like.. you get the idea) It seems weird to me now that people all over are not eating oatmeal for dinner all the time.... yet. I have a strong feeling that everyone is going to be eating savory oatmeal for dinner very soon, so I am giving you the heads up so you can jump on this wagon now! The stuff. 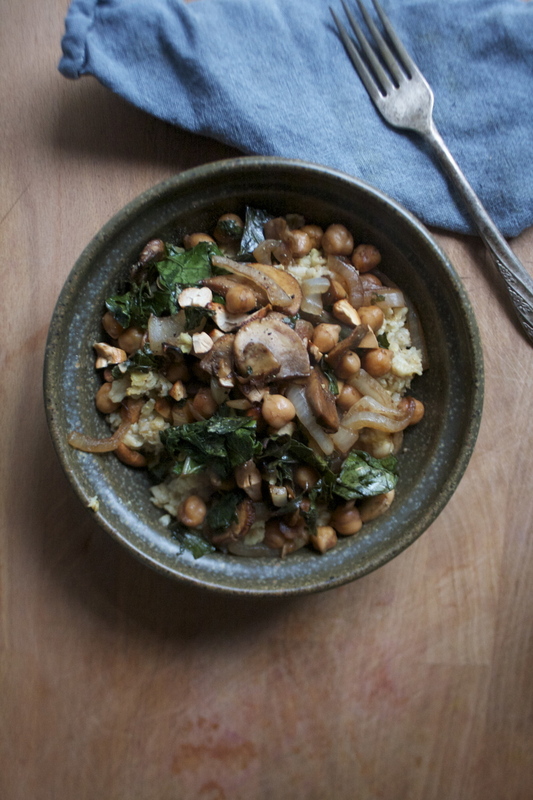 A big cup of old fashion oats, a few mushroom, an onion, some cooked chickpeas, a clove or two of garlic and a mound of chopped greens. And we are going to also need a little olive oil, balsamic vinegar, salt and pepper and, if you have any, a small handful of cashews (or any other nut). Begin by dicing up the onion and the mushrooms nice thing ans tossing them into a skillet with a touch of olive oil. Stick the skillet on the stove on medium heat and begin to cook. When the veggies are on the stove, bring 2 cups of water to a boil, sprinkle it with salt, then dump in your oats. Give the oats a quick stir, then tun the heat down to medium and place a lid on the pot and leave it alone. Once the veggies have cooked down a bit, mince up the garlic and toss into pan, along with the chickpeas (drain any liquid). Add a good glug glug of balsamic vinegar and continue to cook on medium heat until everything is nice and cooked and golden brown and tasty. And lastly, toss in the chopped up greens and stir around until wilted. And i bet that your oatmeal is done by now, cooked until oats are soft and the water has absorbed. And the veggie bean mixture is ready. A big heaping scoop of oatmeal, sprinkled with salt and pepper, and topped with a hearty heap of the cooked veggies and chick peas. Adding a few chopped nuts on top and another glug of vinegar.... It's the most perfect meal. Happy Wednesday and watch you footing! Start by chopping you mushrooms and onions and tossing them with splash of olive oil into a skillet. Sprinkle with salt and pepper and Begin to cook on medium heat. Grab a heavy bottom pot ans bring the water to a boil. Once boiling, dump in the oats, add a pinch of salt, give a little stir and reduce heat to medium low. Stick a lid on pot and leave it alone for about 10 minutes. Once the mushrooms ans onions are starting to cook down, mince up garlic and add in, along with the chickpeas (drained of liquid) and a few tablespoons of the vinegar. Continue to cook until the veggies are browned, the chick peas are hot, and everything tastes good (give it a taste) Lastly, add in the chopped greens and stir around until wilted. Grab a bowl, add a big scoop of the oatmeal, sprinkle with salt and pepper, top with a large amount of the veggie bean mixture and top with another glug of vinegar and some of those cashews all chopped up. Grab a fork or a spoon and eat your oatmeal!